Pentair's new line of compact swimming pool access lifts for in-ground pools includes three lifts: the AquaTRAMTM LT, the AquaTRAMTM and the AquaTRAMTM 360. All three units are battery operated with a 24-volt rechargeable battery that is more reliable and less expensive to install than typical water-powered units. The AquaTRAMTM units come with a one-piece battery and control box with emergency stop button for easier service and more security. The AquaTRAM®LT offers a 500-pound lifting capacity plus a 360-degree swivel for access at any point around the unit. The line offers options to meet the new ADA requirements for swimming pools. Freedom Concepts Inc. aims to create a cycle of mobility for recreation, therapy, fun and mobility for anyone willing to try. Working with medical professionals and families, Freedom Concepts custom-builds each mobility device for individuals with disabilities such as cerebral palsy, autism, spina bifida, muscular dystrophy, Angelman syndrome, Rett syndrome and the visually impaired. In business since 1987, Aquatic Access builds ADA-compliant, water-powered pool lifts that provide access to aquatic activities for disabled people. Internationally known for reliability, Aquatic Access lifts use the safe, green and clean energy of flowing water for power. The Aquatic Access IGAT-180 line of water-powered pool lifts provides the most cost-effective and environmentally responsible compliance with the 2010 ADA Standards for Accessible Design, now a legal requirement for pools that serve the public. 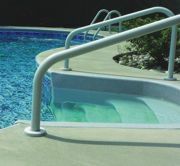 Fabcote's line of powder-coated hand rails for swimming pools and spas uses a state-of-the-art, in-house powder-coating facility to produce an exceptionally durable finish to resist corrosion. The surface of the rail is evenly coated using an electro-static process that drives the coating material into and around all surfaces. All Fabcote rails are made of high-grade 304 stainless steel and can be powder-coated in white or new designer gray to match the décor of the entire swimming pool area. Ideal for rehabilitation and disability access..
For the inclusion of the differently abled in ball-playing sports, competition should be eliminated. Participants play alongside, not against one another. Aggression, running, jumping, offense, defense—eliminated. Taking on the challenge of the court, not others, brings about integration, inclusion and socialization. At Bankshot Basketball, 76 players, regardless of size, age, gender or wheelchair use, participate simultaneously in half a tennis court. No contest, no conflict. These are Total-Mix Sports based on universal design. AMI's XL 250 Profiler and Spa Profiler Dry Water Massage Systems allow your clients to receive a professional therapeutic massage in a face-down or face-up position, simultaneously massaging three sides of the entire body, including the neck and feet, without getting undressed. With the Body Profiling SystemTM you can customize each massage to the client's exact sensitivity and needs, and store up to 100 profiles. No plumbing is required. AquaJogger offers the TriFit Walker aquatic therapy stabilization aid. The TriFit walker is comprised of two 36-inch flotation bars connected with "snap on" crossbar for easy assembly. The TriFit walker is ideal for stability, balance and gait training. It offers different levels of buoyancy and adjustable foam rounds for multiple balance points. Safe and easy to use. Flotation bars can be used independently or connected for walker use. Inter-Fab's new self-operable pool lift, the i-LiftTM —meets the new ADA requirements for commercial swimming pools and spas. The i-LiftTM is an affordable solution and the only lift that offers a wireless remote control as a standard feature. The unit is battery operated, with a low battery warning light and manual override switch, and delivers up to 90 lifts at maximum capacity on a single battery charge. Easy to install and can be removed without tools when not in use.